The shooting on Wednesday of three men at an Olathe, Kansas, bar has been headline news in India — in newspapers, broadcast outlets and on social media. 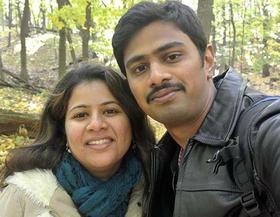 Two of the victims of the attack, Srinivas Kuchibhotla and Alok Madasani, had moved to Kansas from India. The third, Ian Grillot, is from the United States. Adam Purinton, 51, is currently being held on charges of first-degree murder. In India, Wednesday's crime is being seen as a wake-up call following the Trump administration's crackdown on immigration and "America First" policies. On Saturday, leaders in India's Hindu community urged male Indian nationals abroad to wear "tika," a mark on the forehead that identifies them as Hindu. Hindu women were encouraged to wear the red dot on their foreheads known as "bindi." A cousin of Kuchibhotla spoke publicly Friday near Kuchibhotla's family home in Hyderabad, in southeastern India. According to The Indian Express, Satish K said Kuchibhotla's parents had been planning a visit soon. They are devastated, he said, and "his mother has been unwell since ... hearing the news." India's Minister of External Affairs, Sushma Swaraj, tweeted the day after the incident that she'd spoken to Kuchibhotla's family in Hyderbad. She said the Indian government would provide any assistance needed to help return Kuchibhotla's remains to his home. The Indian government rushed officials from the Consulate in Houston, Texas, to Olathe on Thursday. By evening, Indian officials were sitting down with the families of victims, offering condolences and discussing ways the government could be of assistance. The India Times is covering the generosity of crowd-sourcing efforts to help the victims' families with expenses. The latest reports on the GoFundMe pages to help the families of victims say that a fundraising page for Kutchibotla's family had logged at least $573,000. At Garmin Ltd.'s corporate headquarters in Olathe on Friday, Kuchibhotla's wife spoke out for the first time since the shooting. While Wednesday's crime has not been officially labeled a hate crime, federal authorities are working side-by-side with local authorities to see if there is evidence that would support such a claim. The suspect in the shooting, Adam W. Purinton, was extradited to Johnson County, Kansas, Friday afternoon. He is scheduled to be arraigned in Johnson County District Court on Monday at 1:30 p.m.
Laura Ziegler is a community engagement reporter and producer. You can reach her on Twitter @laurazig or email Lauraz@kcur.org.